Life, Love & the Pursuit of Chocolate...: I'm a model, ya know what I mean? Okay, so something BIG happened today. Seriously....huge. Today, I was "discovered". Oh yes, friends...'tis true! For so long I have been contemplating whether working in sales was my true calling, and today I got my answer when I met Tyler. Who is Tyler, you ask? Why, he is only the highly professional, super talented, photographer that discovered me at the Speedway gas station this morning. Duh. Here I was, pulling in to the Speedway to put a little gas in the Matrix, and little did I know that my life (and career path) were about to change! As I was replacing the pump back in the nozzle, Tyler shuffled himself on over to me and said something to the effect of "Excuse me, I couldn't help but notice...with your height and your long hair...that YOU could be a model." 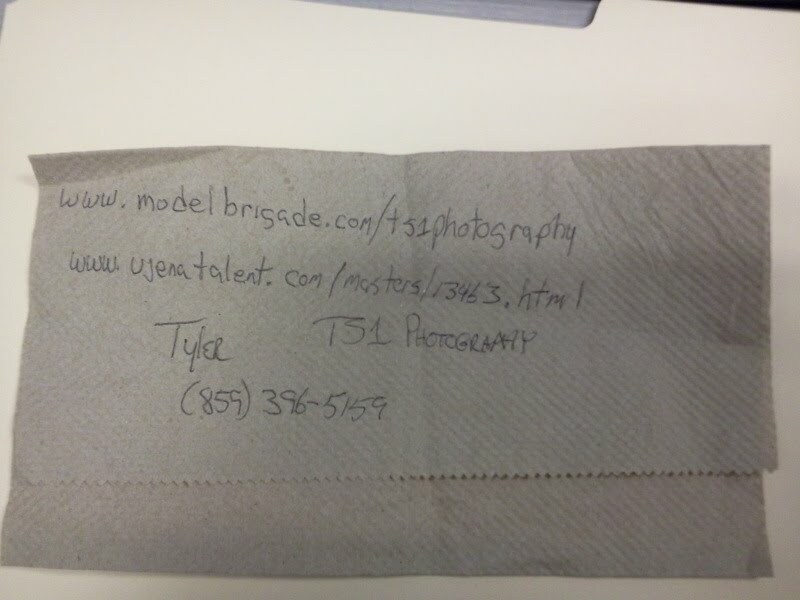 Then he handed me a paper towel with his name, number and websites written on it and said, "Check out my websites, and if you like what you see, give me a call." At first, I was thinking, "yeah right, total scam", but after thinking about the last 5 minutes of my drive to work I realized that Tyler must be legit. I mean who, other than a 100% professional photographer, would notice me at a gas station, approach me on a 50 degree morning in cargo shorts and a t-shirt, and take the time to write his business information on the back of a windshield paper towel?? If that mental assurance wasn't enough, I decided to take him up on his offer to "check out my websites" and see if I liked what I saw. "Main Passion is working with/for MATURE MODELS 40 & Above! Rarely Will I work with Minors!" "I Have LOCATIONS, 2nd to None!" "When You're In Front of My Camera, You're The Most Hottest Beautiful Girl in the World, & Princess of The Universe!" I think it's safe to say that you can expect some serious life changes on the way for this 'lil blogger once my modeling career takes off! Stay tuned! OhMahWord. You are living my dream! 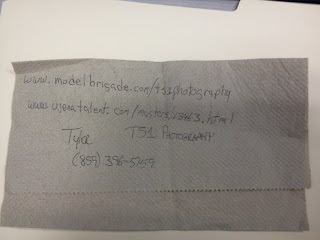 I've AlWAYS want a photographer to discover me and give me his info on a paper towel! My favorite thing to say back to them is, "Obviously you don't *know* who I am..."